I started with 1 bathroom when I lived in Maryland. We moved up to 2 bathrooms when we moved to Arlington, Virginia. When we bought our house, we moved up to 4 bathrooms. 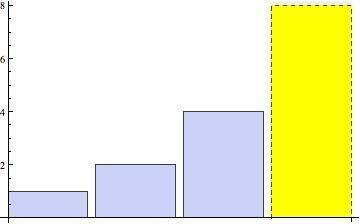 The dotted, yellow bar is the projected number of bathrooms in our next house. Cleaning four bathrooms is a chore enough; I don’t even want to think about eight.